Blogging can have some really amazing perks! I’m astonished at some of the opportunities that have come knocking on my door. Who would have ever thought that blogging could become the best job I’ve ever had! 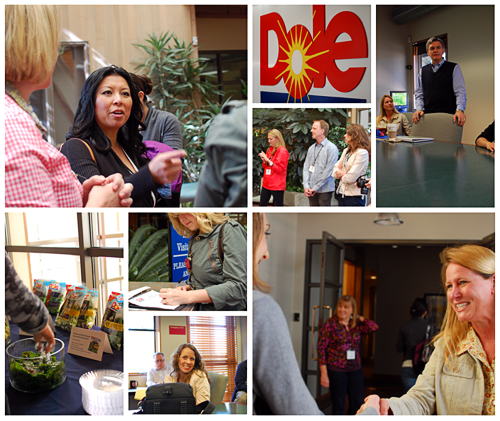 Recently I was fortunate enough to be the guest of Dole for their first-ever Salad Summit in Monterey, California. 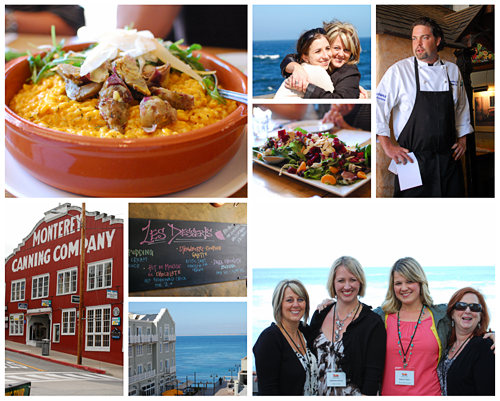 I was treated to three days of bliss at the InterContinental the Clement Monterey with 10 other incredible bloggers. 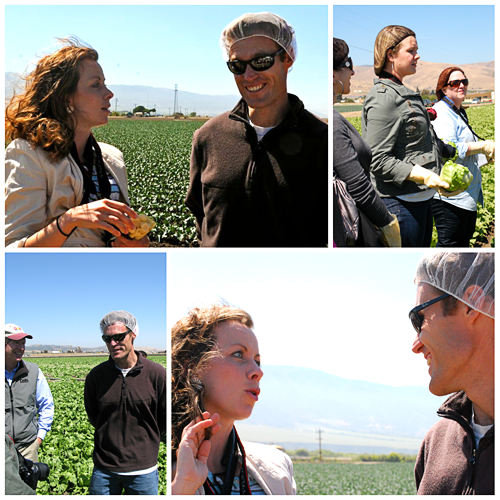 We received an inside look at Dole, by visiting the Dole fields, meeting farmers, workers in the fields, employees and touring their impressive processing plant. Incredibly I have so much to share with you, I hope you don’t mind if I just break it down in to a few posts over the course of the next few weeks. Much of our 36 hours was focused on food, but the better part of day 2 was spent at an actual Dole farm and processing plant. We were asked to ‘gear up’ in hair nets and thick rubber gloves- as we headed into the fields where iceberg lettuce was being harvested. 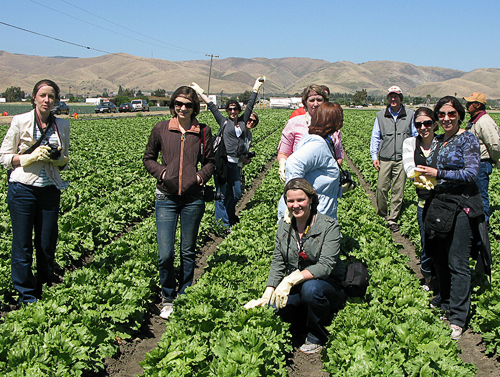 I was amazed to learn that iceberg lettuce is harvested by hand and even bagged right in the field. 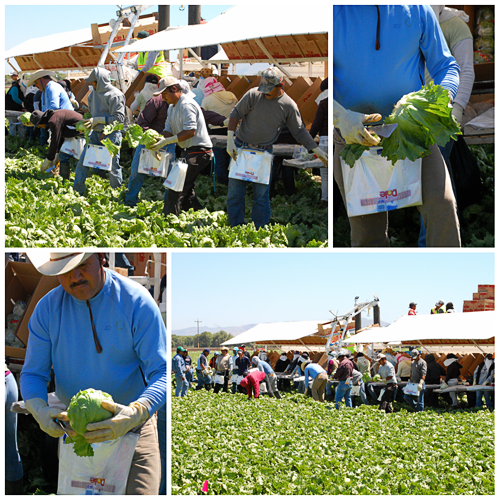 It was almost surreal seeing how the head of lettuce that I throw in my cart every week with out a second thought, was handled with so much pride, attention and hard work. They work together as a team, and were excited to see us out there, they were more than happy to let us get in their way and snap photos while they worked! Many of these workers have worked with Dole for many many years, and have moved up from a base employee, to a team manager, to a higher manager and beyond. 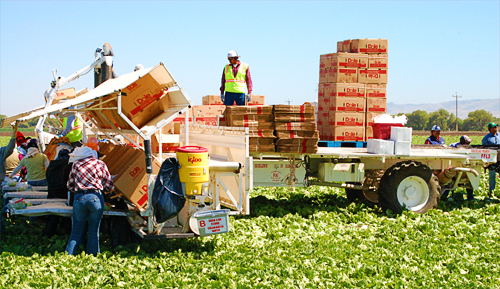 The plastic wrapped heads are packed in a box right in the field, where it is then sent to a chilled area – to be immediately shipped to the customers. We learned that Dole uses smaller family owned farms to carry out the field-to-harvest process. We spoke with one of the farmers who told us he loves living on the farm, “if there is a water leak at 2am, I’m right there to take care of it“. It was heartwarming to know that the food I put on my family’s table is watched over by passionate produce farmers all over the country. Back at the plant we took a tour to see how the produced is processed for packaging. 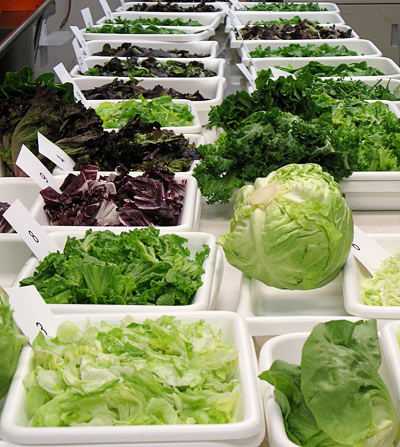 Packaged lettuce actually go through a triple washing cycle in a highly sanitized production plant. The water that is used for all of this washing, is actually recycled and used for cattle field irrigation. This emphasized the importance of Dole’s new packaging with taste, texture and suggested pairings right on the bag. This new packaging hopes to help many venture out and try something other than the standard iceberg or romaine they grew up eating. Be sure to stop and READ the LABELS! I think you will be pleasantly surprised at all the information your can find on a bag of Dole salad! 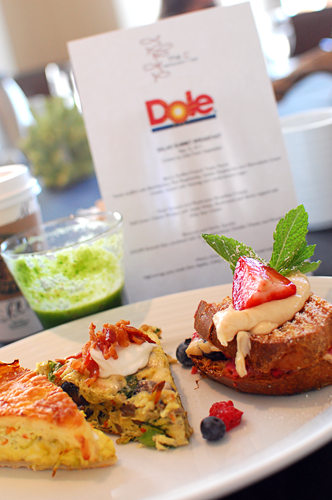 Most of the recipes we ate during our trip were Dole inspired, and I can’t wait to share many of them with you! Our first morning we were served a beautiful breakfast; a green smoothie, berry-stuffed French toast, Frittata and quiche which had be specially prepared by the hotel restaurant using Dole berries, salads and vegetables. Preheat oven to 375°F., with rack in middle. Heat a jelly roll pan at same time. Whisk together, eggs, half and half, garlic, nutmeg, and hot sauce in a large bowl until smooth. Pour filling into 9-inch pie crust. Distribute broccoli slaw evenly over egg mixture. Sprinkle with cheeses and place on heated pan. Bake 30 to 35 minutes or until custard is just set. So here’s the story………..Dole is trying to increase our nutritional health and get more Americans to EAT MORE SALAD! and this new campaign is trying to get us to try new salads and understand how to use them. I’d like to thank Dole for taking such pride in producing fresh fruits and vegetables for me to put on my families plates and in their bellies! Stay tuned for part two! I will share the sights on Monterey area, including Pebble Beach and the 17-Mile Drive, as well as, some of the restaurants we visited. 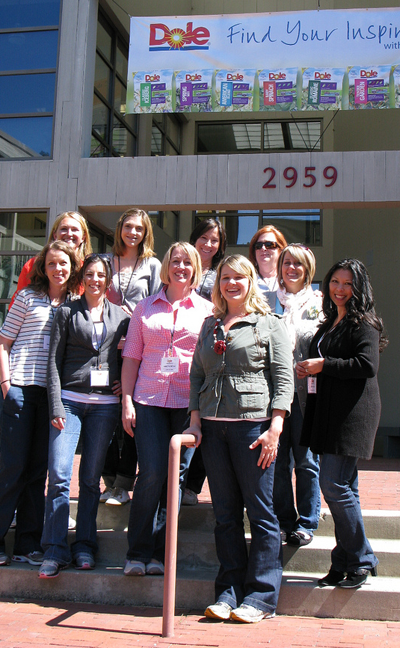 Meet the other Bloggers at the Dole Salad Summit!…..
Disclaimer: Dole paid for all expenses of this trip. However, no expectations were made for my review. All opinions and love of Dole Salad are my own . this was a great trip and it was so much fun to meet you IRL – the food was amazing yes, but the pride that every Dole worker seems to have really moved me . . . and this quiche was my favorite!! Looks like you had a blast!! And that quiche looks SO GOOD!! My mouth is watering. That recipe looks delicious! 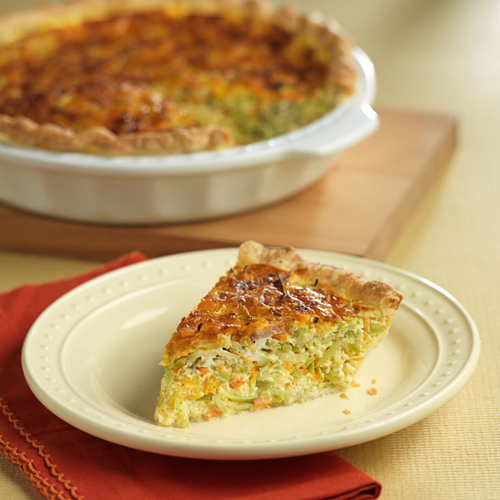 What an innovative looking quiche, perfect for breakfast. My favourite part of this post was the attention that you gave to the Dole Farm employees. 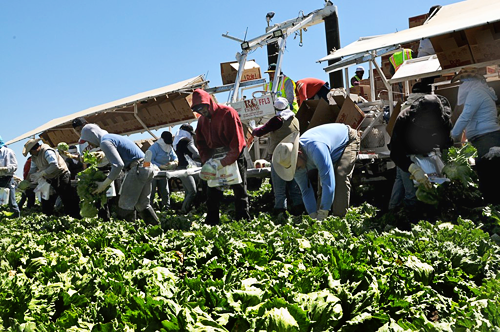 They are the unsung heroes who labour day in and day out, in all conditions to see that these foods we so conveniently and sometimes mindlessly purchase is provided for us to do so. That is really, really interesting! I would love to have seen that in person! HOW FUN! That is so awesome that you got to be there and it looks like you guys had so much fun! I have a question. I am 33 and have been married for about 7 months now and we have just decided to adopt our first child I and don’t know how to cook. :/ I am going to start using a lot of your recipes. The thing is, I have just recently had to start going Gluten Free. 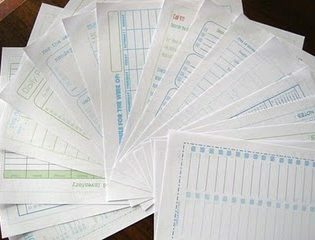 Do you do Gluten Free recipes ever? It was so great to experience this trip with you… such a fun and educational time! Wow, what an amazing opportunity! That sounds like so much fun. 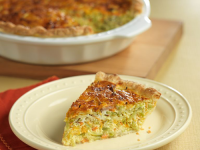 I love salad, and I love quiche too so thanks for the recipe! Can’t wait to hear more about your trip, such a beautiful area!! Great to have you here in beautiful Monterey, Cheryl! Glad you enjoyed it and felt like it was a good experience! Oh my goodness, that sounds like so much fun! And I love to see how much care goes into gardening there. Thanks for sharing! What an amazing opportunity! Looks absolutely fantastic. So jealous! Can’t wait to see even more from your trip, sounds like it was fun and informative. And I don’t know if I could have correctly named all the different types of lettuce either and I love salad! That quiche looks scrumptious! Thanks for sharing the recipe! I’m glad you saw the passion and devotion farmers have to ensure we have food to put on our tables every day. 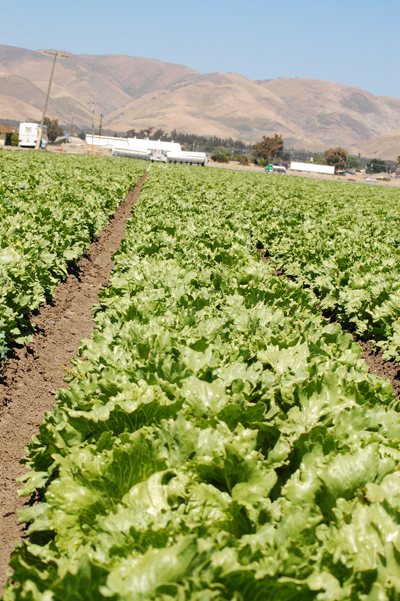 Many times we may not think beyond the grocery store when purchasing food, so I’m glad you were able to experience what a lettuce field is like and share that with others on your blog. Looks like a lot of fun and this recipe definitely sounds like a keeper.